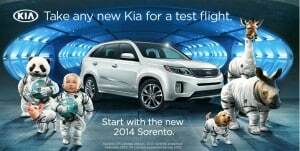 Click here to visit the Kia site and fill out the form. You’ll be able to print out a certificate that let’s you score a free $25 Visa prepaid gift card when you test drive a new Kia. Just head on over before March 31st and have the salesperson fill out the form and you’ll be able to send it in. It’s for the first 10,000 people. You’ll receive the Visa prepaid gift card approximately 6-8 weeks after you send in the form.